Twelve Constables were on parade, accompanied by the Bermuda Island Pipe Band under the command of Pipe Sergeant Aidan Stones. They were led by the Parade Commander and Drill Instructor Sergeant Derrick Golding. Athletic Awards - The Instructors Cup is an award that is given to the fastest male and female officer over the International 10 kilometre or 6 mile Flatts road running course. The Instructors Cup was presented to Constable Kayla Smith for the fastest time of 59 minutes and 10 seconds in the female category. The Instructors Cup was presented to Constable Ryan Swan for the fastest time of 44 minutes and 52 seconds in the male category. Deputy Commissioner’s Cup – This award is for the best effort on the course and the officer who has made the most significant progress. Awarded to Constable Anthony Fernandes. Charitable Presentation – It is a tradition of each Recruit Foundation Course to raise money in aid of a charity of their choice. All members of RFC 79 decided that the Freeman family would be this year’s recipient – to assist with the medical care of baby Iziah Freeman. Baby Iziah has been diagnosed with the rare Costello Syndrome and both his parents are serving members of the Bermuda Police Service. A cheque for $1,400 was presented to Ms. Verna Perinchief and Ms. Erica Smith. The money was raised during a car wash held by RFC 79. Academic Award – Awarded to Constable Kayla Smith, who achieved an overall test average of 95.16% over 19 exams. Commissioner’s Shield – Awarded to Red Syndicate led by Sergeant Derrick Golding; consisting of Constable Ryan Saraiva, Constable Noah Harvey, Constable Daniel Sanna, Constable Kayla Smith, Constable Ryan Swan and Constable Marcus Uddin. Baton of Honour – Awarded to Constable Ryan Swan, who was selected as the most distinguished student officer by the Training Centre staff. 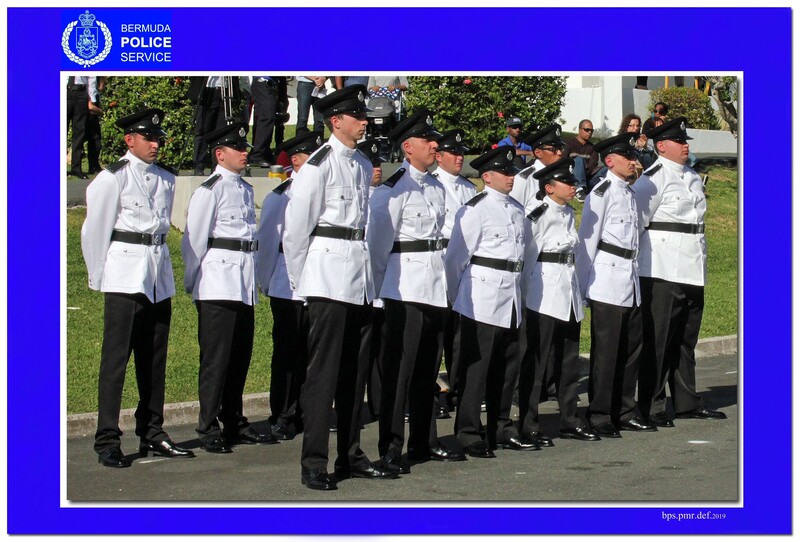 On behalf of the Commissioner of Police Mr. Stephen Corbishley, the men & women of the Bermuda Police Service would like to congratulate and welcome these twelve new officers into the Bermuda Police Service family.